Gold Ahoy is one of the latest game launches from SkillOnNet. This great looking slot machine with 25 lines over 5 reels takes you to adventurous legends of the pirates. All the great pirate symbols are included in this game. The setting of the game couldn’t be better; a tropical island where the treasure chests are hidden! Will the X mark the spot for your fortune? SkillOnNet has once again managed to develop a highly entertaining slot machine which includes several different bonus and free spin features. There is no reason to miss out on this great adventure. All you have to do is to sit back and relax and let the adventure lead you to the treasure. The first glance of this slot machine gives a strong impression; the setting is perfect! The game window is placed on a tropical island where you can see palm trees, fire and skulls. One could easily imagine how suitable this setting is for the pirate theme that this slot machine has. The game window itself is filled with very detailed symbols. Gold Ahoy also has a very suitable music score which is sometimes interrupted with the great sound effects. SkillOnNet’s Gold Ahoy delivers graphics and sounds that is 100% in consistency with the theme. The lower paying symbols in Gold Ahoy are the card deck symbols; 9 to Ace. There are also some very theme designed symbols such as the rum bottle, a ship, the pirate skull symbol and the saber symbol. The wild symbol is the pirate character with the eye-patch. The pirate will substitute for all other symbols except for the scatter and the map symbol. The scatter symbol is the treasure chest symbol and if you hit 3 or more of them you will activate the chest bonus. The map symbol will trigger the free game feature if 3 or more of it appears on the reels. 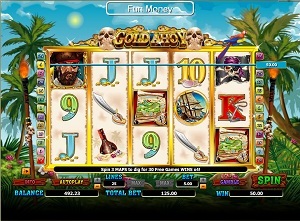 Gold Ahoy’s gamble feature is available as soon as you hit a win on the reels. You can easily access ther gamble feature by clicking on the Gamble button which is located next to the Spin button in the lower part of the game window. Once you have decided to gamble your win, you can choose two different gambles; a 50/50 chance to predict the colour of the next card that will be drawn or a chance quadruple your winnings by predicting the exact suit of the next card to be revealed. If you’re successful in your gamble, you may choose to collect the winnings and return to the reels or to gamble again. If you’re unsuccessful, you will lose your stake and be sent back to the reels. The Chest bonus is triggered when at least 3 chest symbols appear on the reels. The aim for this feature is for you to unlock one of the chests to reveal your cash prize inside. If WIN ALL is revealed, all CHEST prizes are won. If you win the chest bonus during Free Games, the free game multiplier is applied to the chest bonus. If 3 or more Map symbols appear on the reels 3, 4 and 5 during the same spin, you will trigger the Free Game feature. You can win up to 30 Free Games and this feature can be re-triggered while you play it. The multiplier is X4 during Free Games. This means that all winnings are quadrupled when playing the Free Games! Gold Ahoy has 25 pay lines for you to bet on. The minimum bet per line is 0.01 casino credits while the maximum bet per line is 5 credits. You can easily configure your betting preference by using the + and – button in the lower part of the game window. Gold Ahoy includes an Autoplay function which is very comfortable to use. Please note that the Gamble feature is not available while you use the Autoplay function.